I read The Phantom Tollbooth by Norton Juster just recently. I truly enjoyed this book. It is about a boy named Milo who never knew what to do with himself. Milo had everything a child could want. He was bored with everything until one day a tollbooth appeared in his bedroom. Along Milo’s journey he met his friend Tock, a dog with a watch as his body, and the humbug, a beetle that wants everyone to think of him as smart and wonderful. In the land of Digitopolis the trio encountered King Azaz, who gives them permission to rescue the beautiful Princesses Rhyme and Reason. They adventure into many lands ( Digitopolis, The Valley of Sound to name a few) to accomplish their task. While on this journey, Milo learns to value education, use common sense, and especially escape boredom, which is his main problem. You will have to read to find out if they rescue Rhyme and Reason. Juster frequently plays upon the dual meanings of words and expressions to create humorous situations. When Milo orders a “light meal” at Azaz’s banquet, he is literally served light. When Milo catches a word on the tip of his tongue in the Soundkeeper’s fortress, a word physically appears in his mouth. When the Humbug jumps to the conclusion that nothing more can go wrong with the group’s journey, he leaps out of the car and lands on the island of Conclusions. Juster uses puns both to amuse and educate, as these unusual situations often result in Milo learning an important lesson. Another reason I loved this book was the theme to value education. Milo educated himself on each little adventure he went on. This book has a lot to say about the importance of education. As an educator I truly believe learning is everything. Education is the key to success in life. I look forward to teaching this book with my 6th grade students. I hope that they enjoy it as much as I have. 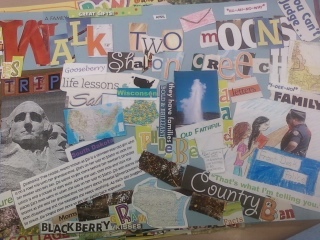 Last week before school let out, each literature circle group created a collage based on their books they read. 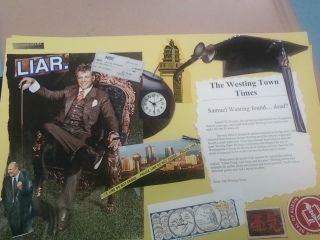 Each collage had to have the title of the book, author, characters’ names, a well-written summary, and a scene from the book. Boy, my students went above and beyond. I was quite impressed how they turned out. The students seemed to have enjoyed the project as well. 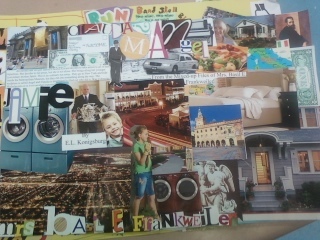 I felt that it was a modern twist to a book report. Once the collages were finished, each group had a few minutes to come up with a short persuasive speech to present to their classmates. My students did a great job at the impromptu speeches. Some even left us wanting to read the books. 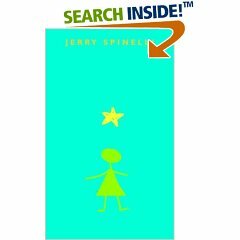 Over my break I read Stargirl by Jerry Spinelli and what a wonderful book it is! Stargirl is about a girl, who calls herself Stargirl, because that’s what she’s feeling at the time. Students at her school think she’s an alien and that she is totally weird except for Leo. Leo is intrigued by Stargirl and gets a chance to know her. Stargirl is an optimistic and always looks to cheer up someone around her. He learns valuable lessons about how people should treat each other and that Stargirl could care less what others think about her. 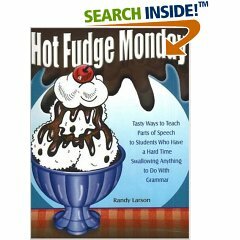 I can’t wait to use this book in my classroom. I have purchased 6 copies so that I can have Literature circles with it. 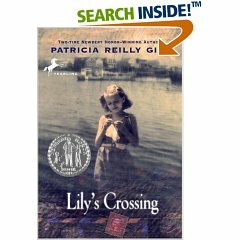 I can’t wait until after spring break because my students and I are going to read together the novel Lily’s Crossing. I just love this book. It has so many themes that correlate to everyday middle school life that I can connect with my students. The novel is about a girl named Lily who spends her summers in Rockaway, New York. She has a problem with lying and she learns that lying can hurt others, especially someone she really cares about. The story is set in the time period of 1944 during WWII. It’s a great historical fiction novel. The way I kick off this novel is by having my students research background information so that they better understand what is going on in the novel. Some of the topics they research are women’s roles during WWII, daily life, D-Day, and the city of Rockaway, New York. I group my students into 4 groups and each group researches their topics on the computer. On the first day, we start with a KWL chart before researching. After completing the KWL chart, the students write questions that they want to find out. Then we spend the next day researching in the computer lab (Tuesday). On the third day, which will be next Wednesday, the students will share their information so that the other students learn about each topic. The last day I have a speaker come in and speak about life during WWII. At our school we are priviledged to have a wonderful lady come and speak to us. She has done this for at least the last 5 years. I love hearing her stories and the kids do too. After spring break, we will begin reading the novel. 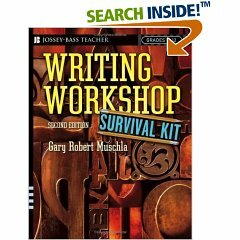 I have found that researching before reading the book has great insight for my students. Plus they get to work on oral communication skills and learn something new. It also gets the students excited about reading a novel together. As you know, my classes are reading novels in literature circles. 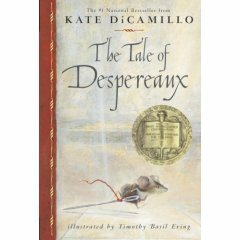 Last year through Scholastic I got the novels The Tale of Despereaux by Kate DiCamillo for my students to read. This book is a great read: fast, thought provoking, and great lessons to be learned. 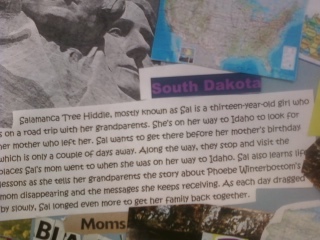 The story is broken into 4 parts which all tie together in the end. The story is about a mouse named Despereaux, which means despair, who was born into a family who didn’t like him much. He was not the average mouse–different because he was smaller than the average mouse and he loved to read, which mice don’t like to read they like to eat the pages. Anyways, Despereaux follows music one day because he love the sounds he heard. This brought him to meet Princess Pea. He falls in love with her and eventually talks to her. This leads him to the dungeon because he broke the rules. In the dungeon he meets a rat and this is where the story unfolds…Despereaux learns the values of faith, hope, love, perseverance, forgiveness, and determination, but you as a reader learn empathy along with what Despereaux learns. I just finished reading this book and I absolutely loved it! Take a look at the amazon reviews. It’s about a 12 year old boy named Moose Flanagan, who lives on the island of Alcatraz, and his sister Natalie, who has autism, which at that time people didn’t know what autism is. Moose has to take care of his sister and looses some of his freedoms because his mother has taken a job, so that his family can afford to send Natalie to a school to help her. His mother is in denial and Moose tries to help her realize this. During the book, Moose becomes friends with the warden’s daughter, Piper, who gets him in trouble. 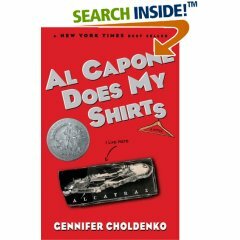 Piper has a fascination with the infamous Al Capone. You’ll just have to read it to find out! The book is set in 1935, which is neat, because it’s historical fiction. I love books that are historical fiction. No curse words, but mature content (speaks of taking a leak a few times, rapists, convicts, Al Capone, and men who haven’t seen a women in 10 to 15 years). The reading level is 3.5–smooth read, but I wouldn’t let a third grader read it because of the mature content. 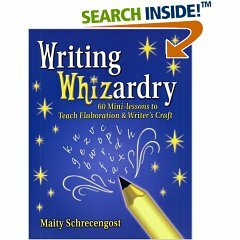 I am thinking about adding it to my library, but having students get signed parent permission to read it since I am in a parochial school. I honestly don’t think the content in this book is any worse than what’s on T.V.